I know everyone always talks about “Spring Cleaning”, but let me tell you- January, for me, is all about the purge! Decluttering, cleaning, organizing, and donating to Goodwill is a great way to start off the new year- who else feels that way? Since I *love* a good jewelry organization & display project, I decided to create a new organizer using a wooden silverware tray that I found on a thrifting trip. It was a nice solid piece and in pretty good shape- just a bit scratched up from the forks and knives of its past. But when I was getting ready to paint it, I was pleasantly surprised to see “Made in Romania” on the back! …with a little help from Cottonball, of course! NOT something I see every day. Well, my good pals at Landrum Eclectics informed me of something very interesting. Apparently “Made in Romania” (or Yugoslavia) was the “Made in China” of the day in the 1950s and 1960s, especially for cheap knock-offs of higher end Danish Modern pieces! Isn’t that wild? This post contains affiliate links for your crafting convenience. Anyway. So, I painted it a soothing jade green (but not the back- I liked the “Made in Romania” stamp). Gosh, I love “Oops” paint samples! I decided to jazz it up with some stenciling- something I’ve never tried before!! I used a shiny gold for my sunburst stencils, and I LOVED how it turned out! Who says an organizer can’t be pretty? Well, now I might be officially addicted to stenciling…just sayin’! Then, I added some small hooks to hang my necklaces on- inexpensive cup hooks in gold tone. I didn’t overdo it with the hooks- I used the exterior “walls” because the wood was thicker and sturdier than the interior slats. Plus, I didn’t want necklaces to get tangled from hanging too close together. There!! Doesn’t that look great? Last, but not least, I needed to add a hanging mechanism! Because I had one in my garage, I added a D-ring hanger to the back. But other hardware- such as a sawtooth hanger or hanging wire- would have worked just fine, too. Final step- ready to hang! And the big reveal- hung on the wall and filled with some of my prettiest baubles! I loved that this particular tray had little cut-out handles, which I used to hang some of my clasp bracelets from. And I was able to set boxes, earrings, and brooches on the little shelves- no wasted space in this fantastic organizer! 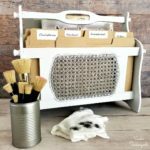 And before you go, please check out my full collection of upcycled and repurposed storage / organization DIY projects! We can all use a little more of that in our lives, right? As usual, genius~just genius! My mind doesn’t work like that (if at all)I would never think to do that with a silverware tray! Such a lovely color you chose, too! Bootiful! Love it! Let’s just call it recycling which is great for our envoirement!…..You made the circle of a product complete by using it again and gave it a new purpose! Salvation Army> is an evangelical Christian organization with some anti…..[not going into that] becauae they do good work for the homeless, teenage mothers and addicts/ outcasted people. Goodwill> makes a practice of employing people who usually can’t find work and facing a big distance to the regular labor market, due to [light] disability, mental or physical. I am loving that color you used so much, next to aquas your teal is perfect and so soft looking. Leave it you to use a utensil drawer for your jewelry, awesome and so perfect, looks fantastic. Looks a very nicely made one also, not cheapy flimsy wood. Great project. What was that paint and name of color you used on this? I am going to tell a friend of this project as she is always seeking nice ways to organize her jewelry. I will be keeping my eye open for these kinds of trays, this one is great, love the color too!! Thanks for stopping by to share this week! Such a super cute idea! I’m saving this on Pinterest and sharing it elsewhere! Wonderful repurpose Sarah! The color is beautiful with the additional gold stenciling. Love it! Pinning and tweeting to share! Thanks for being a part of Brag About It! Thank you so much- and thank you for hosting!! This is awesome! I love your creative vision with a piece that had outlived its usefulness. Trolling the thrift store for gems in the rough is one of my favorite things to do. Love the colour and love the idea of reusing an old thing rather than buying brand new plastic everything. Further to some of the other comments, here in the UK we don’t have Goodwill, we have charity shops on all our high street for all manner of different charities. All goods are donated and there are so many you can pop in to several in one shopping trip just to see if anything shouts “take me home” to you as you pass! Thanks, Julie- I hope I get to check out some of your charity shops in the UK sometime!! Well you’re so clever! It looks great! I’ve never seen anything made in Romania or Yugoslavia before. Love it! I will be looking for a silverware tray to repurpose. Thanks for sharing. What a great way to upcycle that old tray. I love the color you chose. I love Goodwill Shopping for finding lots of soon to be treasures. We’re happy to have you sharing at Snickerdoodle Sunday. Pinned and Tweeted. This is awesome. Clever and CUTE! Thanks for sharing. What a great idea! I would never have thought of this! Thank you so much for sharing over at Celebrate Your Story! Great upcycle! I wish my mind worked more like this when perusing Goodwill. Thanks for the thrifty inspiration! Super cute, functional and thrifty! Featured at Be Inspired this morning. Thanks so much for sharing! I LOVE how you re-purposed this! The paint color is so pretty and it works great as a pretty jewelry holder! What a pretty and neat idea! Sarah, I love this! The color is great and the gold stencils are perfection! LOL, I might be addicted to stenciling now!! What a clever idea!!! I never would have thought to use the tray that way! Great repurpose! Thank you for sharing and linking up with us over at the Welcome Home Wednesdays Link Party! Your upcycle crafts are always fun and functional. I love seeing your new ideas on your blog. So glad you share with us at Merry Monday. Good Morning!! I wanted to let you know that your post has been selected as a Feature for the Welcome Home Wednesdays Link Party!! Stop by this morning to see your post linked up and don’t forget to grab your “Featured” button too!! 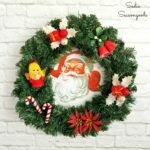 Sadie, popping over from #2usestuesday to thank you for linking up your wonderful post with us! Love that color and how useful it is! I hope you have a fantastic week! I’ve always wondered what I could do with a cutlery drawer, thanks for answering that question! I love how this turned out! Thank you for sharing at the Celebrate Your Story Link Up Party. What a great way to upcycle something!! Good find and great project! Thanks for sharing on My 2 Favorite Things on Thursday – Link Party! Hope to see you again tomorrow! Pinned! Very clever and I love a good find with some history! Super-clever and pretty! Great color and cool way to organize some jewelry! Love this idea! I actually have an extra holder in my yard sale finds so I’m going to give it a try. Thanks! Thank you so much, Judy- I’ll be there! I love the idea, and the colour is super pretty! How cool is that stamp on the back, hey?? Thanks so much for sharing at Sweet Inspiration Sarah! Right?? Thank you so much, Katrin! Never would have guessed that this beautiful jewelry organizer was a cutlery tray!. And how cool is it that it came from Romania? You always find the best stuff! Thank you!! I wish could go back in time 20 years and had a few of these in my dorm room- they would be perfect for that!